Located on the east shores of Okanagan Lake, the Village of Naramata is just 15 minutes north of Penticton. 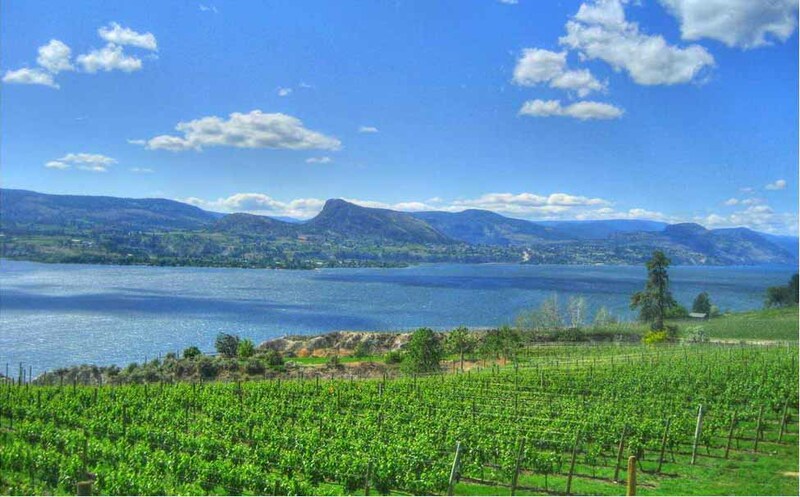 Naramata is known for its stunning views, rolling hillsides of agricultural land, and most of all its wineries. The quiet community is comprised of 2000 residents and is part of Electoral Area E of the Regional District of the Okanagan Similkameen. Naramata’s topography consists of stepped benchlands filled with rich clay soils. The abundance of sunshine, moderate temperatures and cool breezes create the perfect combination for a long growing season, an ideal setting for orchards and vineyards. Being situated on the east-side of the valley, Naramata receives sunshine late into the evening and extravagant sunsets. John Moore Robinson, a businessman and former newspaper editor from Manitoba, came to the Okanagan Valley in 1897 and purchased a ranch that would later be known as Peachland. Over the next years he sold parcels of arable land with orchard development in mind. Known to be the founder of the soft fruit industry, he headed south and established the town of Summerland in 1902. Across Okanagan Lake from Summerland, were the sloping hillsides that Robinson considered as the “ideal location for a perfect community”. He founded Naramata in 1907 and built the historic lakeside “Hotel Naramata” one year later. 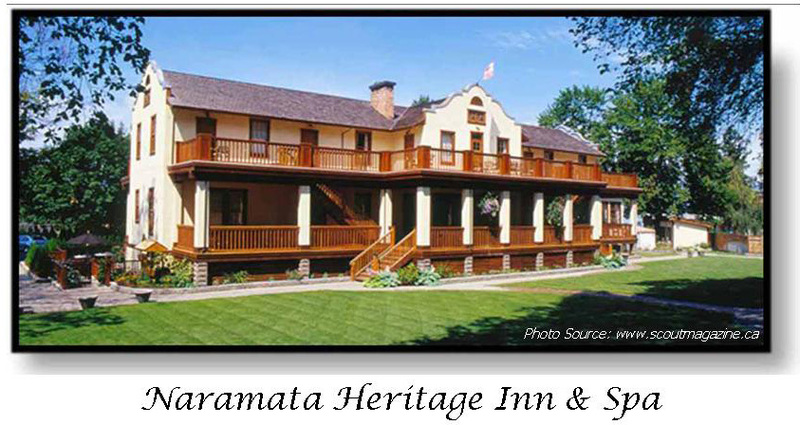 Now known as the Naramata Heritage Inn and Spa, the hotel has been restored and is known for its elegance and luxury. From inception, Naramata was not only a agricultural center but also a cultural hub. Robinson advertized the community as “the Italy of Canada” in an effort to attract farmers from other areas in Canada and Britain. A year after the town was founded an opera house was built. Paddlewheelers would bring people and cargo from other areas in the Okanagan on day trips and would drop off at the “Old Dock” in Mill Bay to attend the concerts, plays and opera’s organized by the residents. In 1914 the Kettle Valley Railway was completed above the village, opening Naramata up to the world. That stretch of the KVR was known to be one of the most difficult areas to construct, due to the steep rock cliffs and the intense amount of rock work required. Naramata is part of School District #67 (Okanagan Skaha) and home to Naramata Elementary School (Kindergarten – Grade 5). Students after Grade 5 are bused to Penticton’s McNicoll Park Middle School and Penticton Secondary School. Other amenities and services include a volunteer fire department, post office, general store, clothing boutique, museum, pub, coffee shop, spa, regional library and many other artisan and cottage industry shops. The village of Naramata is located on Robinson Road (fittingly named after its founder) which leads from Naramata Road down to the shores of Okanagan Lake. Naramata Road is the only road that leads to the village from Penticton, the road meanders along the ‘Naramata Bench’ which is where a large majority of the wineries are located. In fact, the Naramata Bench is known as one of the most scenic wine regions in North America! 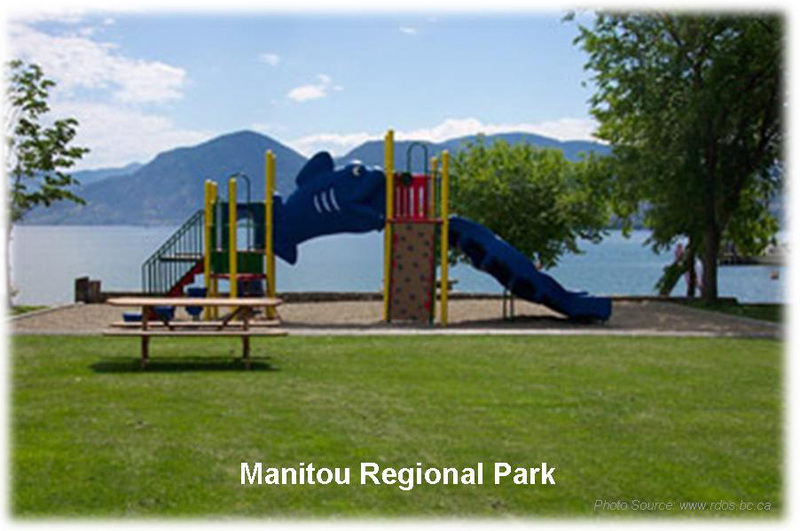 Manitou Regional Park and Beach is a large waterfront park with great beaches on the shores of Okanagan Lake. This family park is beautifully maintained and offers picnic tables, washrooms, a baseball diamond, kid’s playground and volleyball court set in the sand. There is also a dog-friendly beach right beside Manitou Park. 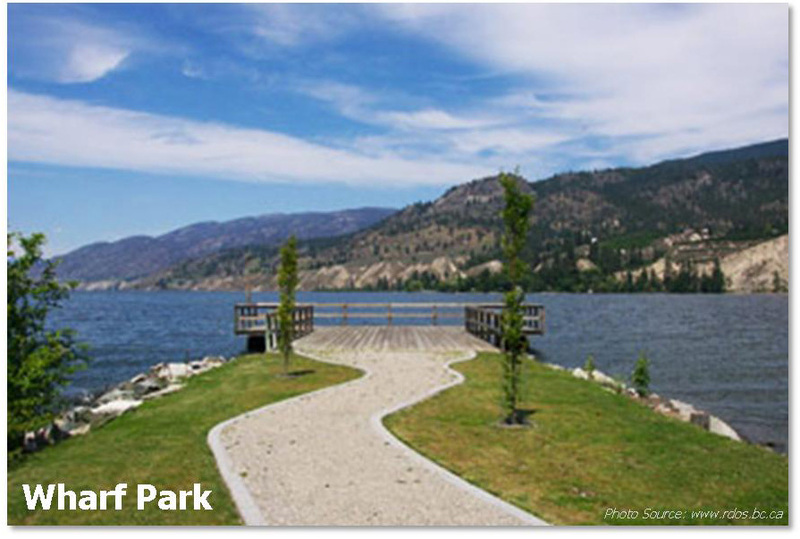 Naramata Wharf Park is a small lakefront park with paved pathways and a viewing deck overlooking Okanagan Lake. This park is where the old rail dockyard was located and where passengers and cargo were dropped off at the “Old Dock.” The nearby packinghouse was shut down in 2009 since so many of the orchards have been taken out and converted to vineyards. The orchards that do remain now take their fruit sales to the nearby packing house in Penticton. In addition to the Inn’s and Resorts listed below, Naramata is home to a large variety of Bed and Breakfasts – a comprehensive list can be found at Discover Naramata. Sandy Beach Lodge & Resort – choice of a Bed & Breakfast room or a deluxe modern log cottage, located right on the lake and complete with heated outdoor pool, hot tub and tennis courts. Naramata Courtyard Suites – centrally located right in the Village offering a variety of suites. The Village Motel – quaint motel in the Village, a total of 9 suites all of which have been recently updated. Naramata and area is home to 21 wineries! It’s safe to say that a trip to Naramata isn’t complete without touring some of these fabulous spots. Check out the Naramata Bench Winery Association for a complete list of member wineries and locations. Visit the Naramata Heritage Museum, open May thru October to learn more about the Village’s history and people. Take a hike or mountain bike along the scenic Kettle Valley Trail. 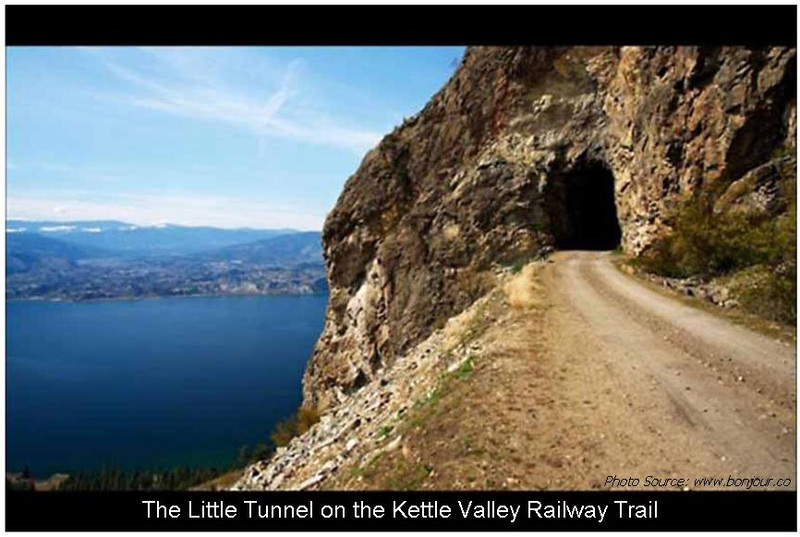 Perched above Okanagan Lake, the KVR is now part of the Trans-Canada trail – explore the rain tunnels and find the rock ovens while taking in the amazing views and scenery. Pack up the kids and a picnic and spend the day at Manitou Regional Park or Wharf Park. Soak up the sun on the beaches while the kids play in the park! A prominent building in the Village permanently closed its doors in November 2008– The Packinghouse, this marked an end to nearly three generations of fruit packing in Naramata. Owned by the Okanagan Tree Fruit Co-operative the building was initially destined to be refurbished, but after further investigation it was decided that the building would be demolished, which took place in the spring of 2011. Since then the property has been listed for sale. Consisting of three separate titles, a total of 5.43 acres (a portion of which is waterfront) is currently listed for $7.5 million. With such a prime location a site like this is destined for future development.